Tarmonbarry, Co. Longford; Stable Row, Walker, Newcastle-on-Tyne; 25 Howard Street, North Shields, Tyne & Wear, U.K. Possibly living at Stable Lane, Walker Colliery, Northumberland. Resident at 38 Berry Street, Walker. Broncho-pneumonia, First Northern General Hospital, Newcastle-on-Tyne, U.K.
Owen was born c.1866 in Longford. He lived in Walker-on-Tyne, near Newscastle-on-Tyne. He was married twice; he married his second wife, Elizabeth Jane Martin (née Carr) in April 1905*; they resided in Walker with their children from their respective first marriages, and what were likely their own children, William and Elizabeth. 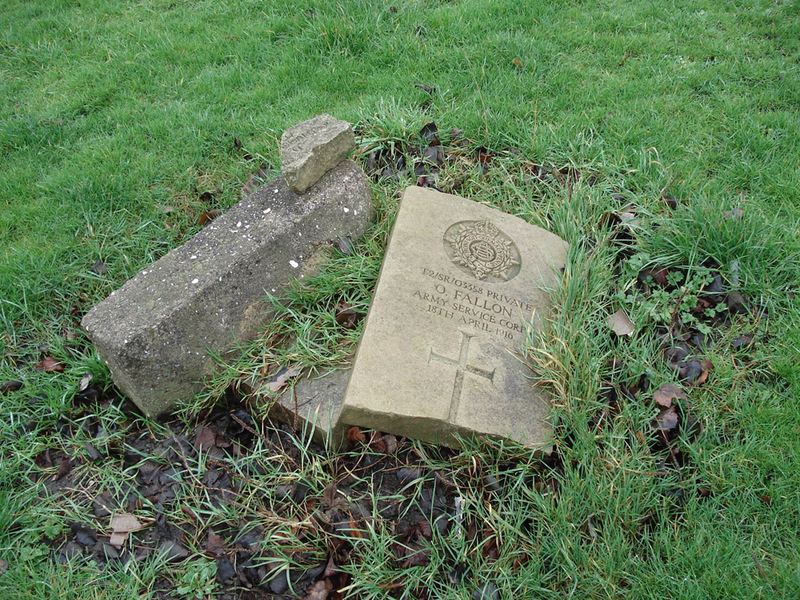 Pte Fallon first enlisted in Newcastle with the Royal Artillery in May 1885, at the given age of 20. At the time he was living there and working as a miner. He remained with the Artillery until c.1898, and alhtough he was primarily based in Britain, he served for 5 years in India, likely near Secunderabad in the centre of the country; from 1886 to 1891, returning home on the H.M.S. Crocodile; it is unclear as to whether Owen returned to the army, particularly at the time of the Boer Wars, until he reenlisted for WW1. After his initial army service, Owen returned to mining. Owen reenlisted for WW1 service wit hthe Army Service Corps, but sadly died of pneumonia in Newcastle. The headstone has been replaced since our photograph was taken: see Find A Grave link below. *The 1901 Census appears to show him married to a Durham-born woman called Mary Anne...likely Mary Ann Gilligan who married an Owen Fallon in Northumberland in 1893; at that time they had two sons, John and Thomas. He had a third son by this first marriage named Owen/John.